At least 42 people have been killed in two car bombs targeting mosques in the northern city of Tripoli. Official sources in Lebanon have said that at least 42 people have been killed in two separate explosions across the city of Tripoli. At least 350 people have been wounded. The al-Taqwa mosque in Tripoli was bombed this Friday after prayers concluded. Only five minutes later, a second explosion hit the city's al-Salam mosque. Tripoli, Lebanon's second largest city of nearly 200,000 people, is one of the country's most volatile sectarian faultiness, with a small Alawite community living among Sunni majority. War in neighboring Syria has raised tensions in Tripoli between the city's Sunni Muslim and Alawite communities. Sheikh Salem Rafii is one of the most prominent Sunni leaders in Lebanon and opposes Lebanon's Shia Hezbollah terrorist group. It is not clear whether he was at the mosque at the time of the attack. At the scene, ambulances rushed to the aftermath of the blasts and heavy black smoke covered the sky. Television captured the chaos showing numerous cars on fire, with their windows smashed, and people running through the streets trying to carry wounded people to safety. Bodies could be seen on the ground and windows were broken on surrounding apartment blocks. 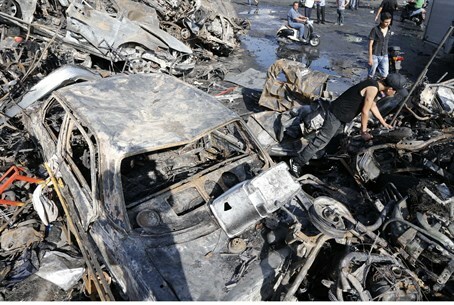 The bombs follow yesterday's assassination of a leading Sunni supporter of the Shia Hezbollah group in Tripoli. Hassan al-Mouri was shot to death yesterday along with two other people by masked gunmen.